In the early days of Apple, Steve Jobs was well known for his intense perfectionism and the often adverse effects that it had on those working at the company. Jobs would need final approval on every single small detail of the early Macintosh computers, he'd fire talented employees without hesitation for not immediately conforming to his design aesthetics, and he'd scrap nearly-finished projects that didn't meet his standards for elegance. While it's certainly true that his attention to detail and relentless drive led the company to create some of the most beautiful (and best) technology products the world has ever seen, his style of leadership was less than admirable in the beginning. It also meant that Apple would spend nearly three years developing the original Macintosh computer. This intense drive for perfection often leads to the failure of young technology companies, that should be focusing much more seriously on validating their core product offerings - not perfecting them straight out the gates. Eventually, Jobs' demeanor and an internal power struggle over disagreements on philosophies between him and CEO, John Sculley, led to his ousting from the company. In Jobs' eyes, this was devastating. He later shared in an interview: "What had been the focus of my entire adult life, was gone. It was devastating." Jobs saw his ousting from Apple as an incredible personal failure. He had been pushed out of the company he had worked so hard to grow into a recognizable brand. He would later go on to found NeXT and spin Pixar off into its own entity after purchasing the animated division of Lucas Films, before returning to Apple in 1997. By the time he returned to Apple, Jobs had learned the importance of tempering his obsession with control, and he was much better at empowering his talented employees, to do what they do best. This change in his leadership style is without a doubt a very significant contributing factor in Apple's return to the spotlight after suffering through some major setbacks during Jobs' absence from the company. 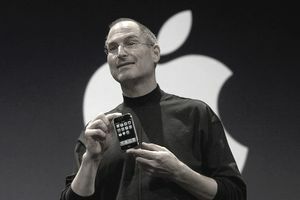 Once he returned, he led the charge on Apple's new OS which redefined how personal computers function, the iPod which completely revolutionized the music industry, and the iPhone which has been equally as important in the evolution of personal technological devices. As an entrepreneur, you'll never be a success if you're too reckless or unshakable in your way of thinking. However, you do need to take risks along the way, push for the results you want to see in your business, and accept that there will be failures at times. Although Steve Jobs is no longer with us, he truly changed the world with the products he helped shape, and lessons he imparted along the way. Most importantly, he didn't allow his initial failure at Apple to define his life. He went on to learn from his experiences, create more businesses, and eventually return to help make Apple great again. Embracing his failure gave him the motivation to move further forward.